They give you the freedom of contact lenses, with the comfort you’ve been missing. They are a great solution for patients with an active lifestyle. Advanced blink-activated moisture technology offers outstanding comfort throughout the day—with every blink you can make the most of every day. Amazing benefits: Refreshing Blink-Activated moisturizing agents provide remarkable comfort, No lens care necessary, Crisp clear vision, Easy and convenient and Available in toric and multifocal! When used according to your eye doctor’s instructions, daily disposable lenses are a healthy option for your eyes. If your eyes don’t look healthy, feel healthy or see well, schedule an appointment for an eye exam as soon as possible. 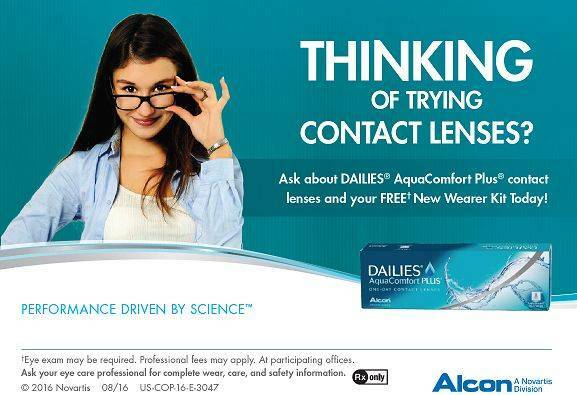 DAILIES® AquaComfort Plus® Contact Lenses—So comfortable you can focus on enjoying what the day brings. Have you heard of the ACA Child’s Insurance? C. B. Tracy and Associates, Inc.